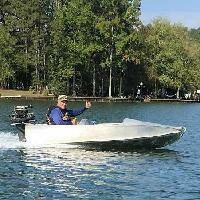 You are here: Home Forum Home Alumi-Classics 52 Duracraft Sportsman restoration. TOPIC:	52 Duracraft Sportsman restoration. Beautiful boat! What color is that? My wife LOVES it, so I'm gonna have to copy you..lol. DAIHATSU PEACOCK BLUE METALIC with larger metallic than the formula called for (because it's a boat of coarse) this is a single stage catalyst paint. I originally picked out a NISSAN color that was almost identical but I decided against BC/CC due to the extra time involved in the paint process (I actually like the looks of a BC/CC better) so they had to color match it to find a single stage formula. I can always scuff it and apply a clear coat later for more depth if I decide to. I have been busy, the wiring is complete and neatly tucked away, ignition switch, horn button (although I have not found a place I like to mount my vintage trumpet horn, so the wiring is just stubbed and tucked away for now) lighting switch and safety kill switch are all installed. 88 Johnson 25 mounted to the rear with the electric start modification completed (yes the pull rope still works) I had to modify the cowl base plate to make the throttle work, but I think it turned out nicely. The battery box, relay box and fuel tank are all installed and I just mounted a fire extinguisher behind the front seat back. The seat cushions are being made but I just couldn't wait for them to take pictures and post an update (it will give me something to post later on) Anyway enough of my rattling on, here are the pictures! Things are a little slow here on the aluminum drydock, but I have been "piddling" around some. Here are a few pictures of my latest progress. Looking great Casey, getting close now! Great job. A lot of hard work but it is paying off in spades. A boat you can be proud of. 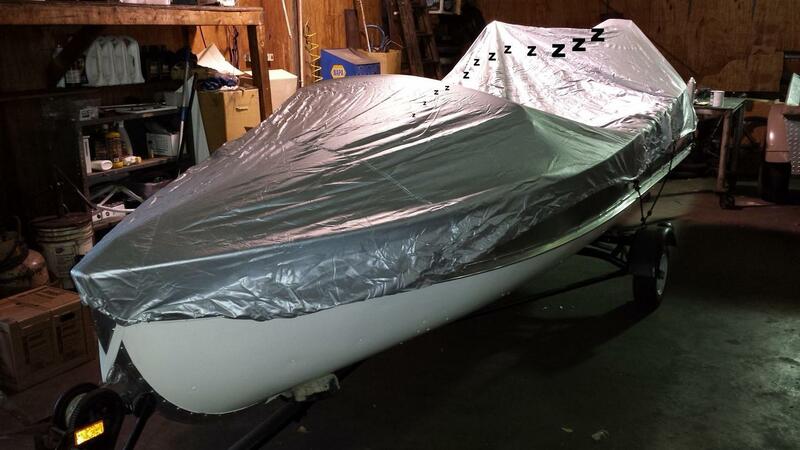 I hope one my boats will look half as good. What do you think about painting the motor Holiday bronze and cream? Maybe some '57 decals? Thanks for the kind words. What boats do you have? I love seeing all types of restores. I've been trying to think how to "vintage" up my Johnny. Vintage paint color and decals have been a thought of mine too. Hadn't thought about Holiday bronze. Could be a nice contrast. Everybody needs a nice lummie! Lot of good brands out there, some possibly better than others, some for sure more costly, but hard to beat a DuraCraft for how well they are built and you can usually find a deal one one pretty regular on EBay or Craig's list. Look who the cat drug in. Congrats on getting it splashed. this is it for now, video to come later. Looks really good Casey, nice work! Thanks, was a fun journey. 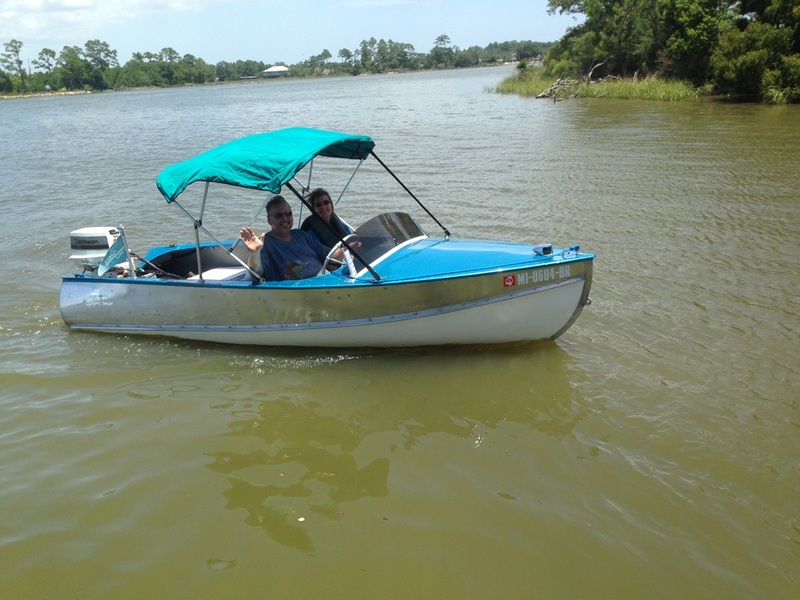 More summer fun on the water, with the Bimini top installed. Thanks! Would love to see some pictures of yours. That's just DOWNRIGHT PURTY. 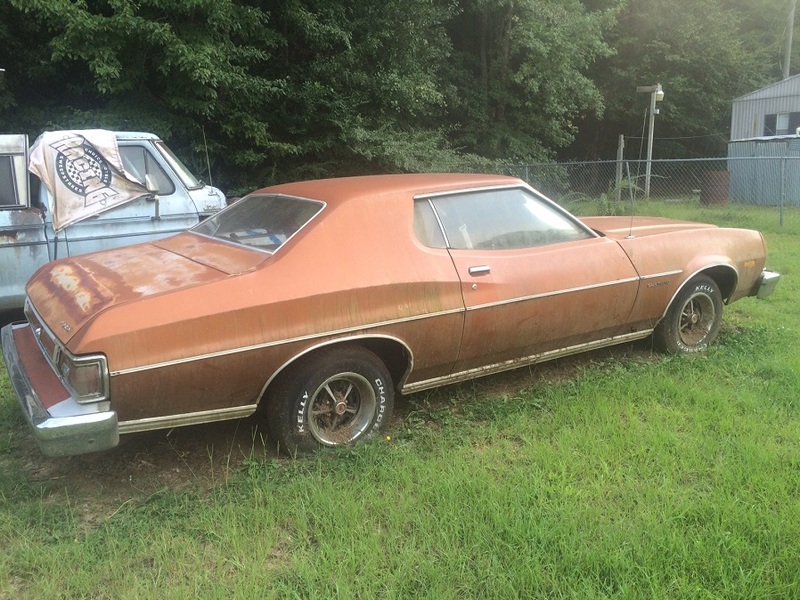 - I hope that my TEXAS MAID tin runabout/trailer looks even HALF as nice. Thnx SATX, I'm sure yours will turn out great if you put in the time and effort. I really enjoyed my build and it was nice to get a little reward play time in her this past Summer. My "roomie" says that that's the "prettiest thing that I've seen in a long while." & then "I hope the Osprey looks that well, when it's finished." Sorry about posting to a thread that has been dormant for two and a half years. It is hard to find info on these old DuraCraft ships. Mine has the exact same hull as the ship in this restoration thread but mine has a duel cockpit deck. I'd like to know what year and have attached a photo of the serial number. Here are 3 pics of the DuraCraft like yours. 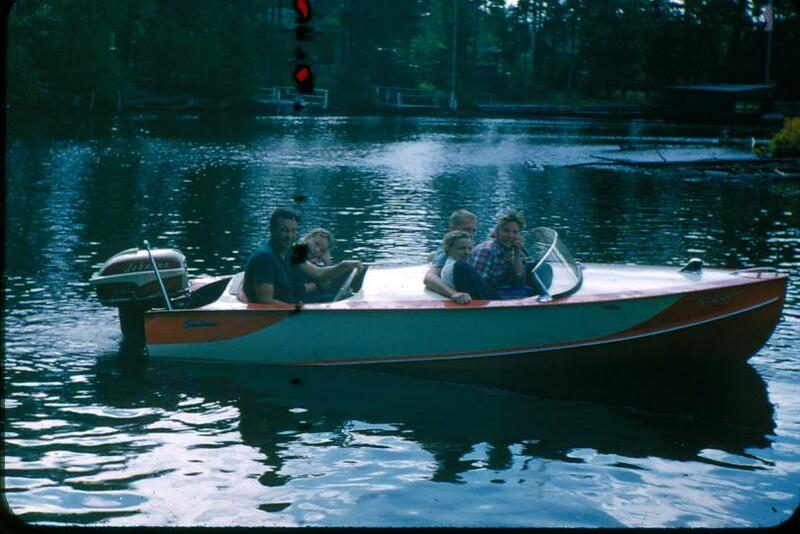 The one with the Evinrude on it is one I found and sold to a friend around 2005 and he painted it similar to the original paint job from the 50's. 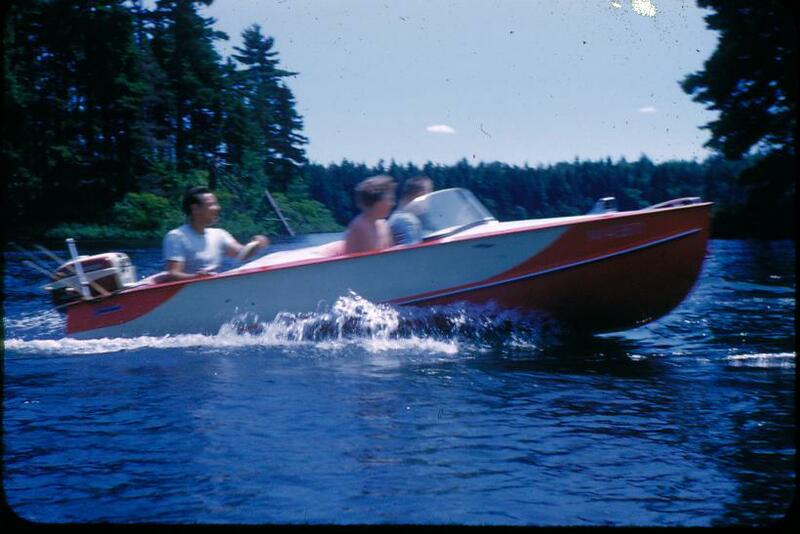 The other 2 pics are from 1957 slides of the same model that belonged to family friends that shows the original paint job. The seats in the original 57 model, I remember were red tufted canvas cushion seats and back and were held on with snaps on the deck behind the cockpits. Not sure how long this model was made. The lowest serial number I had found in my research was documented as a 1952 model and that was SN 10160, so based on that, I'd have to say that yours is no newer than a 1952 model. Mine was missing the dash plaque, but I found the stamped number in the hull on the port side just under the gunnel trim about mid ship. That number and the plaque number should match. I sold my boat for $3,500.00, so don't plan on getting rich off it LOL. donsaulsbury wrote: Here are 3 pics of the DuraCraft like yours. m casey stock wrote: The lowest serial number I had found in my research was documented as a 1952 model and that was SN 10160, so based on that, I'd have to say that yours is no newer than a 1952 model. Mine was missing the dash plaque, but I found the stamped number in the hull on the port side just under the gunnel trim about mid ship. That number and the plaque number should match. I sold my boat for $3,500.00, so don't plan on getting rich off it LOL. Thanks for the info Casey. Nice restore you did there. So hard to find good info. Did your open cockpit model have flush rivets under the splash rail? EDIT: I can see from your photos that yours are not flush rivets. All rivets that touch water are of the flush type on my boat. EDIT: I found the serial number exactly where you found yours. Port side outside under the gunnel near the front dash. Interesting about the flush rivets below the water line. I have tones of pictures from my research on these boats, I'll have to go back and look at them and see if I notice that in any other models. The process my have changed later that year since yours is closer to the beginning of production. Or, it may be something the did on the dual cockpit hulls to make them slip through the water faster? Always something different with these old tins. I didn't restore mine with the thoughts of selling either, I love restoring things in general and when I'm done if I keep enjoying it I'll hang on to it, otherwise I usually sell it. 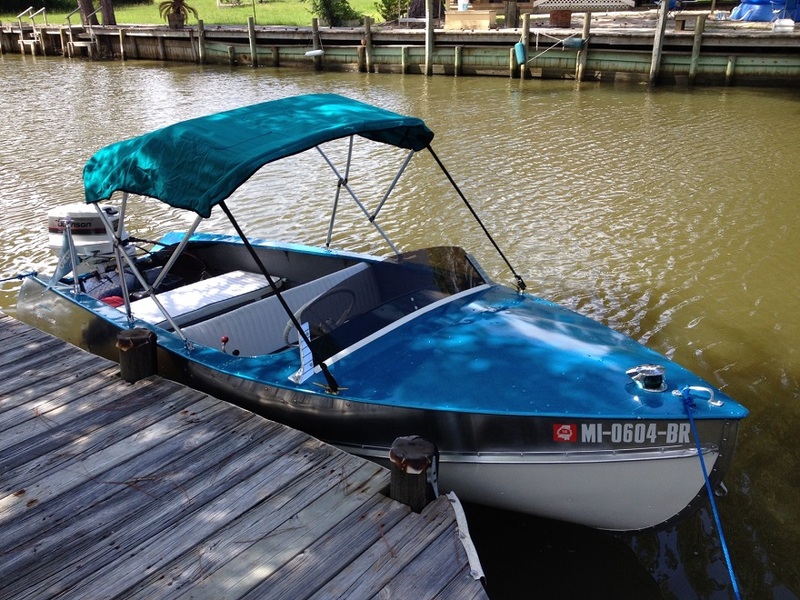 In the case of mine, because I have another more modern boat more suited for the environment I usually boat in, it wound up sitting collecting dust, and I think these things should be seen and enjoyed, so I passed it along. 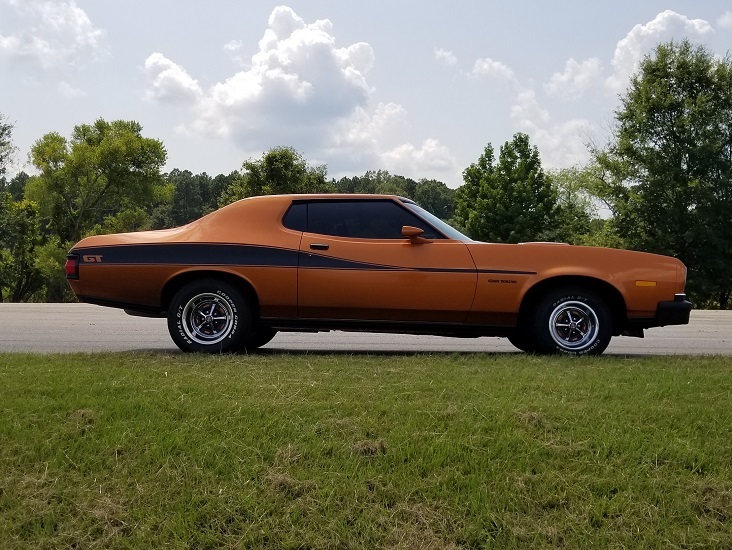 I did 100% of the labor myself except the custom seat padding, the $3,500.00 covered all the actual cash I put into it and since I got great enjoyment out of the labor, I felt good about the selling price. The new owners just love it and put it in the water quite often. Awesome. VinTin wrote: Thanks for the info Casey. Nice restore you did there. So hard to find good info.. I read your whole thread a few days ago before buying this boat and found your thread very informative.